Complete this survey and get a piece of candy!!! Check out these great flyers created by the Juniors in Art Balzotti's Graphic Arts class. They did a fabulous job. Bravo! Check here for updates on the events scheduled for Teen Tech Week! Check out the Blog Post about Teen Tech Week! Teens’ use of nonprint resources has increased dramatically in recent years, yet more teens are doing this from home instead of the library. Studies show that most teens have access to the internet and spend almost 6 1/2 hours a day using some form of media. According to the Pew Internet and American Life Project, 71% of teens report that the Internet is their primary source for completing school projects. Using the internet and digital mdia requires critical thinking skills and technical expertise. 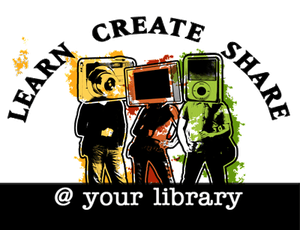 Teens need to know that the library is a trusted resource for accessing information and that librarians are experts who can help them develop the skills they need to use electronic resources effectively and efficiently. Teens, in order to gain the skills necessary to compete in today's job market, need access to digital and online information and trained professionals who can help them use these resources effectively, efficiently and ethically. Teen Tech Week is a chance for libraries to throw open their physical & virtual doors and show their communities all the great things they're doing for teens with technology.